My sexual orientation has nothing at all to do with saving the President's life, just as the color of my eyes or my race has nothing to do with what happened in front of the St. Francis Hotel. A native of Detroit, Michigan, Oliver "Billy" Sipple served in the United States Marines in Vietnam. A piece of shrapnel left him disabled. While living in San Francisco on disability pay, he became active in local causes, including the campaign of Harvey Milk, an openly gay candidate for San Francisco city supervisor. 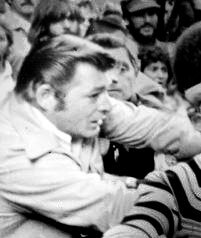 On September 22, 1975, Sipple was standing among a group of people waiting to see President Gerald Ford as he exited the St. Francis Hotel in San Francisco. As President Ford emerged, Sipple noticed the woman standing next to him raise a .38-caliber pistol at the President. Instinctively, Sipple lunged at the woman, deflecting her aim as she fired the pistol. The bullet missed the President by five feet. Police arrested the woman, Sara Jane Moore, who received a life sentence for the assassination attempt. Following the incident, Sipple shied away from media attention. However, gay activists in San Francisco cited Sipple's actions as a positive example for the movement. Harvey Milk said about Sipple, "For once we can show that gays do heroic things." Legendary San Francisco Chronicle columnist Herb Caen wrote about Sipple, including his sexual orientation. Several newspapers across the country picked up the story, and the news reached his Michigan-based family, who were unaware of Sipple's orientation. The family became estranged for a period of time. Feeling wronged by the media, Sipple filed suit against the newspapers that outed him. The case was ultimately dismissed. Sipple's experience remains an ethical debate in law and journalism schools. Sipple became reclusive and his health worsened. He died from pneumonia in 1989. Among the personal items collected from his apartment was a framed letter hanging on the wall, which read: "I want you to know how much I appreciated your selfless actions last Monday," signed, "Jerry Ford."